Last week, I made homemade sopapillas, which were crispy, warm, fluffy and oooh so yummy. Elle was so happy about the sopapillas. I drizzled honey on top, and it wasn’t but a few minutes before she plowed through the first one, and was asking for a second. It was great to see her eat something she enjoyed so much, but the aftermath was a bit… messy. She had honey all over her hands, clear up to her elbows. It was in her hair, on her shirt, all over the table, and the chair. I picked her up to carry her over to the sink to wash her hands, and my hands were coated in honey by just touching her. Honey is messy. But the mess was totally worth how much she enjoyed the sopapillas! I had some leftover homemade sopapillas, so I decided to make stuffed sopapillas. Stuffed sopapillas are a staple at the New Mexican restaurants I frequent. 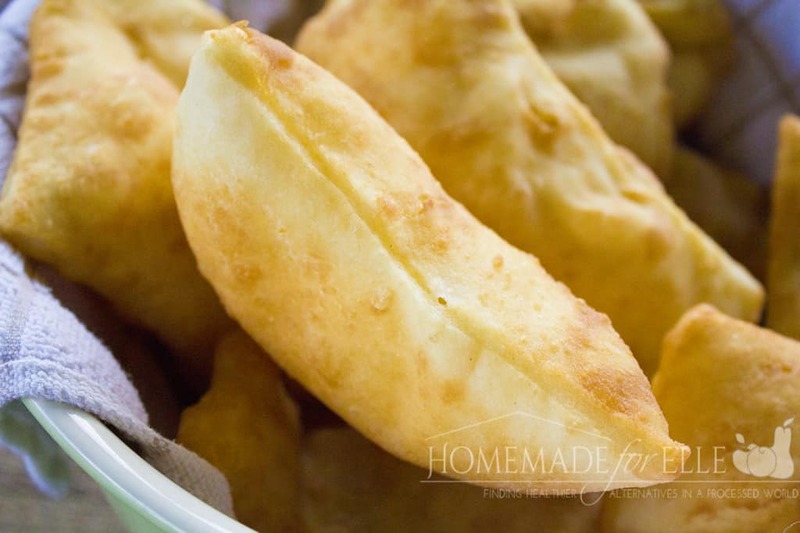 They consist of a warm and fluffy sopapilla, with a thin layer of refried beans, some cooked and crumbled ground beef, with a sprinkle of shredded cheese. Then you can top it with whatever veggies you like: shredded lettuce, diced tomatoes, chunks of ripe avocados, a light garnishment of cilantro, and I would definitely recommend a drizzle of homemade salsa. I kinda think of stuffed sopapillas like Mexican pizzas. You can swap out your toppings, until you find your favorite one. If using day-old sopapillas, warm up in the oven at 300 degrees. Warm refried beans on the stove top over medium heat. 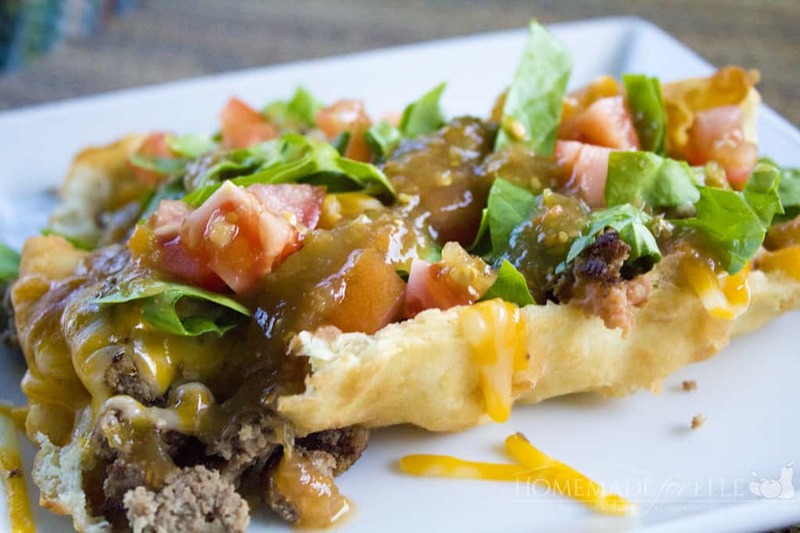 Spread 1/8 cup of refried beans onto each sopapilla. Top evenly with 1/4 cup ground beef, followed by 1/8 cup of shredded cheese. Followed by any other toppings that you want! 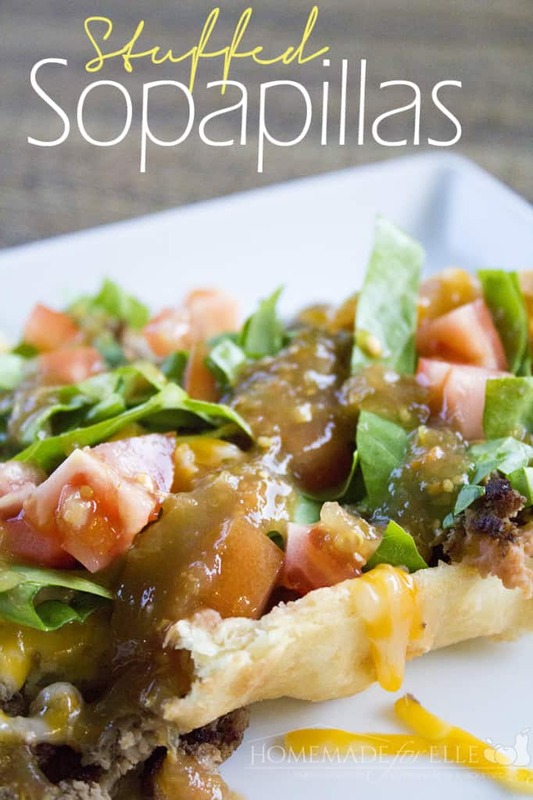 Have you ever tried stuffed sopapillas before? What type of toppings would you add? You have to stuff the sopapia with beans and a seasoned ground beef… THEN… cover it with your FAMOUS New Mexican Chili Verde!! !